tyi X in x 2SV4 in. 3/4 x 7 x 13Vi in. V4 x 13x 20V2 in. Vi x 3 x 20V& in. 3/4 x 8 x 20^ in. % x 2 x 15 in. PHOTO B: Lay out the curves on the bench legs. Set your compass to draw a 2-Tn. radius to draw the arcs. Connect the layout iines with a straightedge. 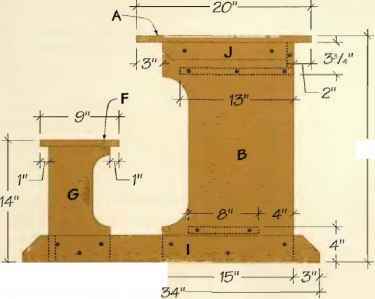 Q Make the bench legs: Refer to the Bench Leg Layout drawing, page 273, to draw curved cutouts along one long edge of each bench leg. Scribe the curves with a compass set to draw a 2-in. radius. Connect the curves with a straightedge (See Photo B). 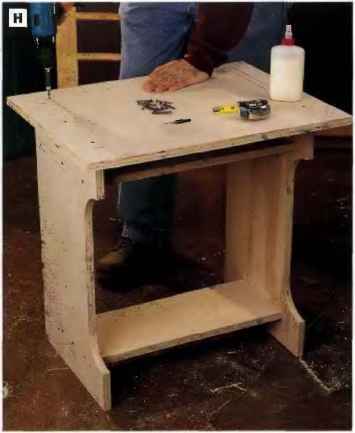 O Cut the bench legs to shape: Secure each workpiece with clamps to your work surface to hold it. 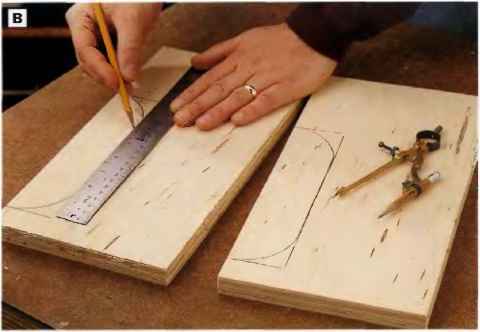 while you cut, and follow your layout lines with a.jig saw to make the bench leg cutouts (See Photo C). 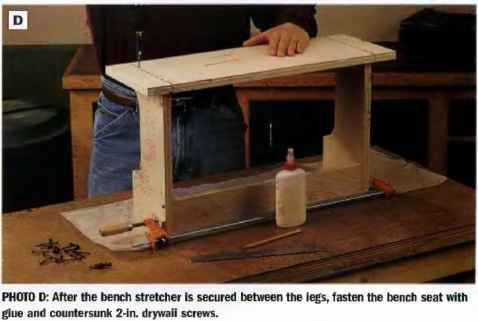 © Assemble the legs and bench stretcher: See the Exploded View drawing, page 272, for information on arranging the bench stretcher between the two bench legs. Notice that the stretcher aligns with the back bottom corner of the legs. 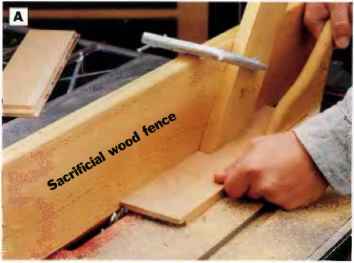 Spread glue on the ends of the stretcher, clamp it in place between the legs and attach the parts with countersunk 2-in. drywall screws driven through the legs anrl into the stretcher. 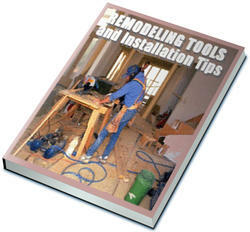 © Install the bench seat: Position the bench seat on the ends of the legs opposite the stretcher. The seat should overhang the legs 2 in. on the sides and 1 in. over the front and back t:dges. Lay out leg centerlines lor screws on the top face of the seat. Drill countersunk pilot holes along these lines, apply glue to the top ends of the legs and secure the seat to the legs with 2-in. drywall screws (See Photo D). 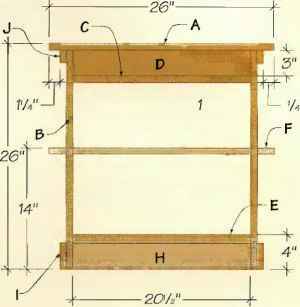 ©Attach the shelf back to the shelf; Orient the parts so one long edge of the shelf overlaps the shelf back, forming an "L" shape. Spread ghio on the muting surfaces of these parts and clamp them facedown on your workbench so the clamps overhang the bench. Drill countersunk pilot holes through the shelf and into the shelf back. Fasten the parts with 2-in. dry-wall screws (See Photo E). 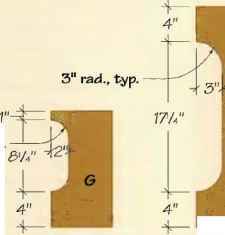 © Mark and cut the curved cutouts in the desk iegs, according to the Desk Leg Layout drawing, page 273. To draw the shape, scribe the 3-in.-radius curves with a compass, and connect the curves with a straight line. 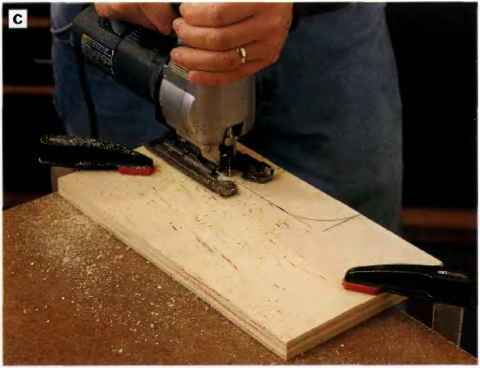 Make the cutouts with a jig saw. 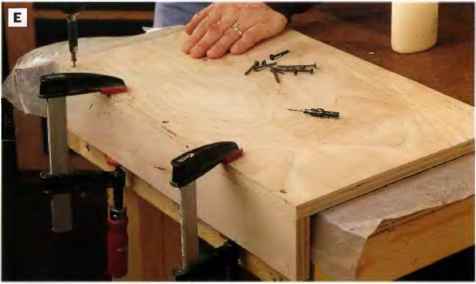 PHOTO C: Clamp each bench leg to your workbench and cut to shape With a jig saw. Be sure your clamps don't Interfere with the path of the saw. PHOTO D: After the bench stretcher is secured between the iegs, fasten the bench seat with giue and countersunk 2-in. drywaii screws. PHOTO E: Spread giue aiong ore edge of the shelf back and ciamp it flush with the back edge of the sheif. Attach the parts with countersunk 2-in. drywall screws. 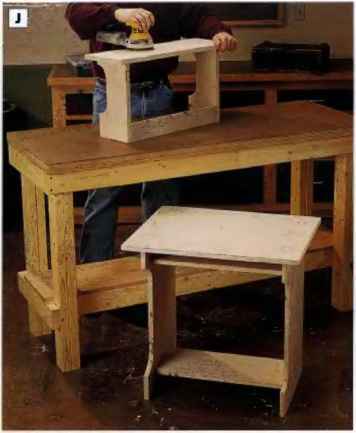 PHOTO F: Lay out the sheif and footrest positions on both sides of both desk iegs. 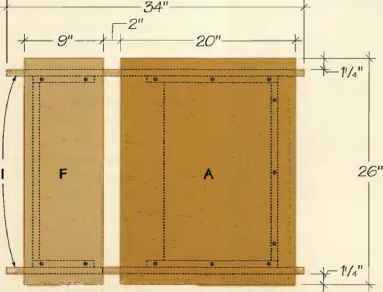 See the Side Elevation drawing, page 273, to position these parts. O Mark both faces of the desk legs to determine where they will attach to the shelf, shelf back and footrest. The Side and Front Elevation drawings on page 273 show the locations of these parts. Draw part outlines as well as screw locations on the legs (See Photo F). 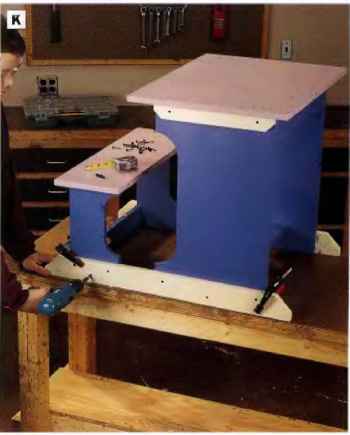 © Attach the shelf assembly to the desk legs: Arrange the parts upside down on your workbench. This will ensure that the top edge of the shelf back and the top of the legs will be flush. It's helpful to place a couple 3-in.-wide scrap blocks under the front edge of the shelf for support. Spread glue on the ends of the shelf assembly and secure the shelf between the legs with a clamp or two. Attach the legs to the shelf and shelf back with 2-in. drywall screws, driv ing the fasteners at the marked screw locations. © Attach the footrest to the desk legs: Spread glue on the ends of the footrest and align it with the marks on the insides of the legs. 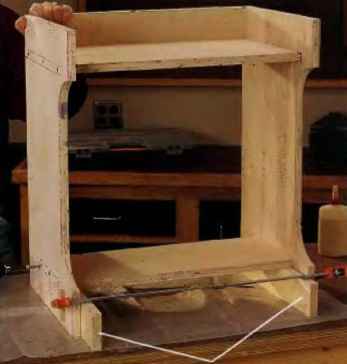 Support the footrest with 3l4-in.-wide scraps of wood from beneath and clamp it in place. Dr ive countersunk 2-in. screws through the legs and into the footrest (See Photo G). 3 in. on the front. 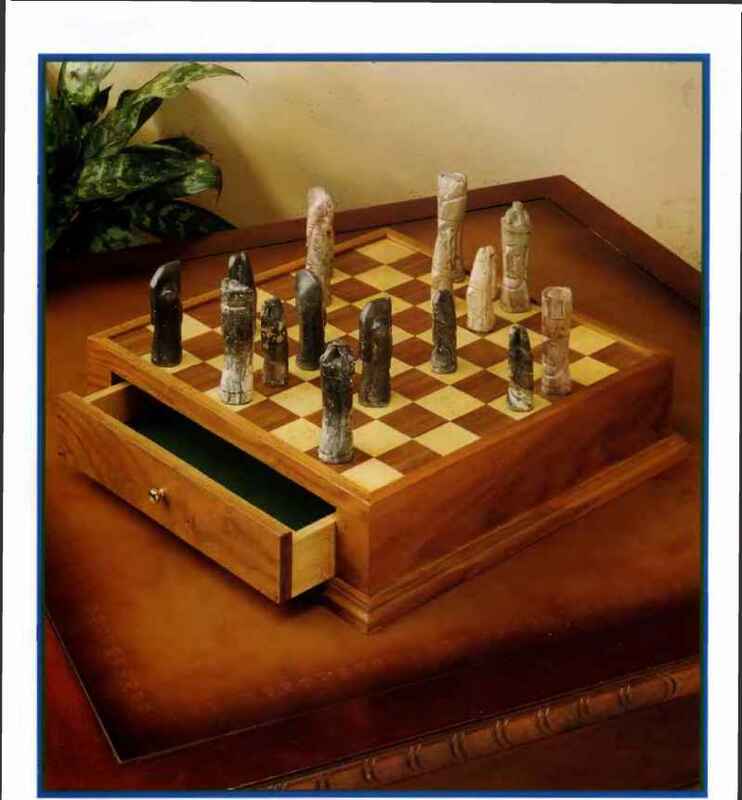 Outline the shapes of the legs and shelf back on the top and bottom faces of the desktop with a pencil and straightedge to determine the screw hole positions. PHOTO H: instaii the desktop on the iegs and shelf back with giue and countersunk 2-ln. drywail screws. Mark the positions of the legs and sheif back on the desktop for locating the screws. PHOTO G: Install the footrest with glue and screws. Insert a couple of 3 V4-in.-wide spacer Mocks beneath the footrest to hoid it in position temporarily while you screw it in place. project to the shop floor' so you can work at a comfortable height. Spread glue on the top edges of the legs and shelf back, and set the desktop in position. Hold the desktop steady while you drill countersunk pilot holes for the screws. Secure the top with 2-in. drywail screws (See Photo II). (2) Mark and cut. 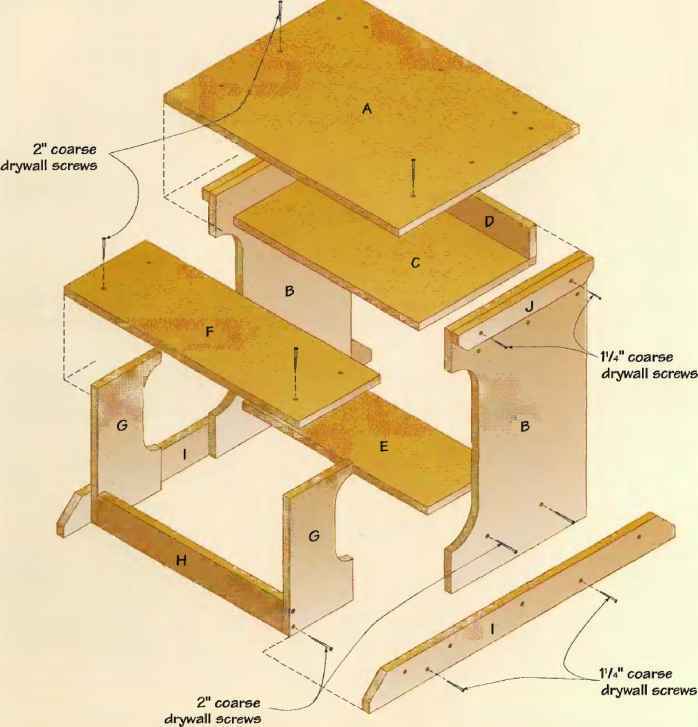 the angled corners on the desktop cleats and runners to match the Top Cleat and Runner End Layout drawings, page 273 (See Photo I). Guide the saw against a clamped straightedge. Because of the narrow width of these cleats and runners, you may need to support the straightedge with a piece of scrap before making the cuts. © Fill al! the screwhoies and any edge voids in the bench and desk, Sand the bench, desk, top cleats and runners smooth (See Photo J). 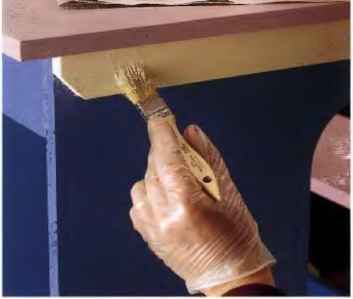 ilD Prepare all project surfaces for- paint with a coat of primer. 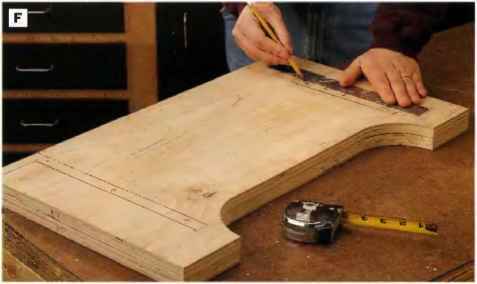 PHOTO I: Mark the angled ends of the runners and cut the corners with a circular saw. 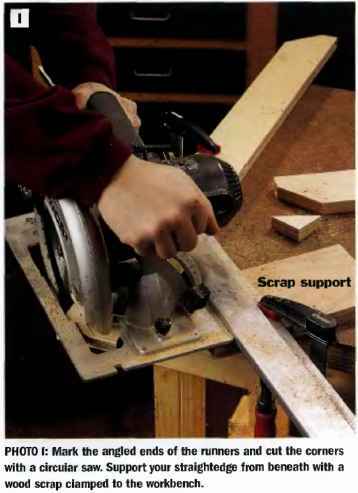 Support your straightedge from beneath with a wood scrap clamped to the workbench. PHOTO i: Once you've filled alt tiie screwhoies and any voids in the plywood, sand the bench and desk before you prime and paint. A random-orbit sander and 150-grit sandpaper wiii make this a quick task. PHOTO K: Fasten the runners to the bench and desk legs with countersunk lV^-in. drywaii screws. Hold the parts together with «lamps while you drive the screws. Stagger the screw pattern. PHOTO U Conceal the screwheads on the desktop cieats and runners with wood putty and paint. sure that each color has dried completely before taping it off and painting another area. © Fasten the desktop cleats to the desk lugs: Clamp the cleats in place so their angled comers face down. Drill countersunk pilot holes through the cleats and into the legs. Install tin: cleats with a couple of lH-in. drywall screws. ©Attach the runners to the bench and desk: Clamp the runners along the bottom ends of the bench and desk legs so the angled ends of the runnels face up. Position the parts so the ends of the runners overhang the bench and desk by 3 in. (See the Side Elevation drawing, page 27'1). Drive a staggered row of 1 lA-in. drywaii screws through the runners to fasten the parts together (See Photo K). © Fill the screwhead holes in the desktop cleats and runners with wood putty and sand smooth. Touch up these spots with paint to complete the project (See Photo I,).